Julia is particularly attractive for its ability to run in parallel, not only on clusters, but also on the multiple cores of your laptop processor. Here is a minimalistic example using pmap(). ### Main part - runs only on main instance of Julia. The same code with -p 39 can also be run on the 40 CPUs cluster of my department! 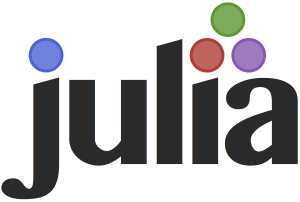 For more material on parallel computing with Julia, you may take a look at Julia documentation.